The Akiles CoilMac ECI 5:1 Binding System is a Manual Punch/Electric Coil Inserting system. Easy to use, it will punch up to 17-sheets at a time utilizing the 5 to 1 coil punch die. The Electric Coil Inserter is activated by a foot-switch making coil insertion fast and easy. The CoilMac ECI is the most popular coil binding machine on the market and includes a set of coil crimping pliers. There is a 4:1 version of the CoilMac ECI. If the 4:1 pitch is what you are looking for the part number is COILMACECI41 . Die Disengagement Pins: For a clean punch with multiple paper sizes. Open Punching Throat and Continuous Punching Guide: For an easy alignment and punching of longer documents. 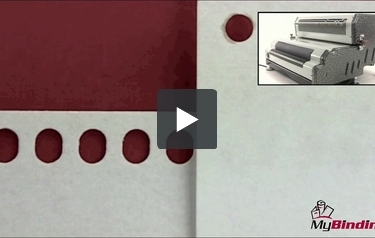 Binding Capacity: Up to 7/8"
Welcome to MyBinding video. 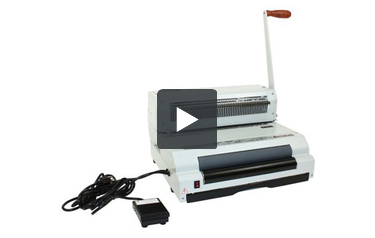 Today we look at the CoilMac ECI, an electric coil binding machine by Akiles. Heavy duty, yet simple and efficient, the CoilMac can handle a lot of binding. Let's bind a book and watch it in action. First, you set the side margin control knob so that all punches are consistent throughout your entire project. Next, disengage any of the five disengageable die pins so there are no half holes punched on all standard sized documents. With this knob, you can control the depth of the margin of the punch for your project so it best fits your size coil. It's always wise to use scrap paper for your first punch. Once it's all set, begin with the covers, putting the spine side in first and make your punches. Continue on with the rest of your project, punching holes in all the papers, up to 17 sheets of 20lb paper per lift. Now it's time to assemble your project together and bind it. Start by threading a coil through the first few holes of one end. Then use the hand or foot pedal to engage the inserter. Let the coil spin all the way through your document until it hangs out on both ends. And then crimp both ends with coil crimping pliers. That's it. That's the CoilMac ECI by Akiles. For more demos, reviews, and how to's on this product and many more, check out MyBinding.com. Welcome to MyBinding video. This video is made to help you understand the difference between the regular and the plus models of the CoilMac line. Akiles makes four CoilMac machines, the M, ER, ECI, and EPI, and their corresponding Plus versions. Side by side, each model looks to be very similar. They have the same features but have two major differences. Welcome to MyBinding video. This video is made to help you understand the difference between the regular and the plus models of the CoilMac line. Akiles makes four CoilMac machines, the M, ER, ECI, and EPI, and their corresponding Plus versions. Side by side, each model looks to be very similar. They have the same features but have two major differences. The first, the shape of the punch. On the regular models, that is the M, ER, ECI, and EPI, the holes that are punched are round and they are 4mm in diameter, punching four holes for every one inch. On all four of the corresponding Plus models, the holes that are punched are oval-shaped, 4mm wide and 5mm tall, also with a 4:1 pitch. The oval holes are more popular because they tend to work better with thicker documents and lay out more naturally along an 11-inch length. Also with oval holes, the beginning threading that you must do by hand is much easier. The second major difference is the disengaging punch dies. All Plus models have fully disengageable punch pins. This allows for a clean punch with virtually any document length and without fear of half holes punched. While all of the regular models have only five disengageable pins, which allows you to work with the most standard sized of documents. Those are the two major differences. Now you're on your way to choosing the right machine. For more comparisons, demos, reviews, and how to's, check out MyBinding.com. Do you carry 5:1 pitch coil? Yes. You can find a pretty good selection of 5:1 pitch coil on our site. Most of these coils are made to order but only take a couple of days to ship. However, if you need them faster give our customer service number a call and we can see about getting them expedited for you. Electric Coil inserter roller is not gripping the coils. Does it need to be replaced? It sort of depends on what exactly is happening and what you have tried so far. First, look at the roller when your coil comes into contact with it. If the roller stops spinning due to the resistance then you probably need to replace the small clear belt that drives the roller. If the roller continues to spin but is too smooth to grab onto the coils then you will need to try a few more things. If that is the case first start by taking a damp cloth and thoroughly wiping down the roller. Sometimes paper dust collects on the roller making it less effective at grabbing the coil. If that doesn't help you have two choices. You can get a can of roller cleaner/rubber renew like this one https://www.mybinding.com/martin-yale-paper-folder-roller-cleaner-13oz.html or you can purchase a new roller. If you decide that you need a new belt or roller give our customer service department a call and they can help with parts. If you want to go with the roller cleaner then you can order it right online or give us a call and we would be glad to assist you.